We are very excited to introduce our clients to iSpring Solutions. iSpring is a powerful tool that offers another option for creating interactive courses to use within the Informetica Learning Management System. Sencia and iSpring developers have been working together to test the compatibility of iSpring generated courses with Informetica and we are very pleased to report that SCORM 1.2 and SCORM 2004 packages worked flawlessly when imported to the LMS. We’ve been using iSpring internally for years to create interactive presentations but it was at the Learning Solutions 2013 conference where we really touched base with the company and realized the full potential of their software. After sitting down with the iSpring team for a demo and seeing how easy it was to create an animated and interactive course, we immediately thought of the benefits the software would be for our clients who create their courseware in-house. We encourage you to visit the iSpring website to download and test the software for yourself and see what we're so excited about. iSpring’s authoring tools enable anyone to create great interactive e-Learning courses right in PowerPoint. Available on a special PowerPoint tab, iSpring will help you enrich your courses with narrations, quizzes, interactions, course player and more. After the authoring process is finished, iSpring will publish your courses for the Web or LMS. 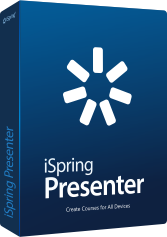 The newly released iSpring Presenter 7 can publish courses to the Flash, HTML5 or combined format, which allows playing content on mobile devices. To learn more about iSpring’s authoring tools, check the iSpring website.